What’s Wisdom? I don’t know. Yay! We have been exploring the third Paramita*: Letting Go, learning how to hold whatever arises in our experience lightly. This naturally leads to the fourth Paramita, Wisdom. At the center of the beautifully-crafted structure of Buddhist concepts are the three universal characteristics of awakening. When looking at wisdom from a Buddhist perspective, these three essential concepts are key. Each deepens our understanding and softens our need to grasp, cling or make enemies of what arises in our experience. We will be exploring them over the coming weeks. But first, what is wisdom anyway? It seems easier to say what it is not: It is not something we can acquire. It is not a body of knowledge that if we just study hard enough we get to claim as an accomplishment. There is no test to take, no grade to achieve, no Masters of Wisdom degree to be awarded, and nothing to put on the resume. Nor is wisdom a personality trait we are born with. Admittedly some babies look like ancient sages and some children have more common sense than others. A few seem in touch with the mysteries, but then that umbilicus to the unknown dries up and falls away, as they focus on learning the many skills needed to navigate this earthly life. When we develop a regular practice of meditation, we find that we become more present, more alert, more relaxed and more compassionate with ourselves and others. The tight tangle of our thoughts that held us captive now has more space, so we can see the process of the thoughts arising and falling away. It is certainly easier to hold whatever arises in our experience lightly when we are not so enthralled with the tangle of life. This may sound like a spacy way to live, but perhaps we could say that one aspect of wisdom is finding the balance, the ‘both/and’ of living in a way that we can skillfully function in this corporal existence while having that more expansive understanding that informs our intentions and actions. In our practice we are not looking to escape this life but to embrace it lightly, with greater understanding of the true nature of being. We can understand this nature based on our scientific knowledge of the make up of atoms — how every solid-seeming object is actually mostly space at the atomic level. And we might sense it in a spiritual way, feeling at one with God, nature, all that is — however we name that experience for ourselves. It helps to let go of the need to have everything locked down, categorized and figured out. This frees us to embrace the mystery, the not knowing. We let go of fear and the crushing need to define ourselves and our world, and to constantly be shoring up that separate-seeming identity and belief. We can still pursue whatever knowledge draws us, but we do it out of the joy of exploration rather than the fear of not knowing or the need to accumulate knowledge. The kind of meditation I teach is called ‘insight meditation’. 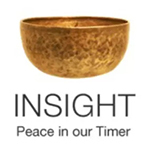 In this tradition, insights are a common part of the meditator’s experience, especially the retreat experience. Sometimes they happen. Sometimes they don’t. It’s important to do the practice and set the stage for them, but also to accept that they show up when we are ready for them. We only need to do the practice and trust the pace. When insights arise, they may feel very subtle or absolutely amazing. Holding them lightly, lovingly and respectfully, we can savor them and allow them to open us up in surprising ways. Insights may reveal to us flashes of sensing our infinite nature and connectedness. Sitting beside a waterfall or staring at a pane of glass on a rainy day can remind us how we are like drops of water: ultimately not separate. We are just having a briefly individuated experience, a separate-seeming ‘moment’ in time. So we can perceive there is a ‘both/and’ truth: We can operate on a daily basis inhabiting this body and life as if we are separate beings in order to get around, do our errands, etc., but we are also suffused with knowing that what we hold to be ‘me’ is simply a brief expression of the overall oneness of being. And we find that we are much more joyful and compassionate when we live from the awareness of that oneness. We don’t have to choose one perspective over another. We allow our awareness to expand to hold both. That is one aspect of wisdom. In Buddhism it is called Anatta, no separate self, and it is one of three characteristics of awakening. If that resonates with you, then you have probably had moments of deep understanding. If it doesn’t, if it sounds strange or even scary, then just know that it is something that is available through your practice. Don’t strive to understand it. Don’t struggle with it. Don’t judge yourself as lacking. Let it go. And for all of us, it is skillful to focus on acts of generosity and ethical conduct that help us feel connected with others. Practice letting go and holding whatever is going on lightly. In this way, the first three Paramitas help to pave the way toward insights and wisdom. *The ten paramitas, aka paramis and perfections of the heart, are qualities of being that end suffering and activate joy. This entry was posted in insight, Paramis, Paramitas, Uncategorized, wisdom on May 15, 2016 by Stephanie Noble. Now I feel ready to begin my day, by holding lightly.